The FLOWER EXPLOSION necklace is definitely a refreshing, handmade beauty. 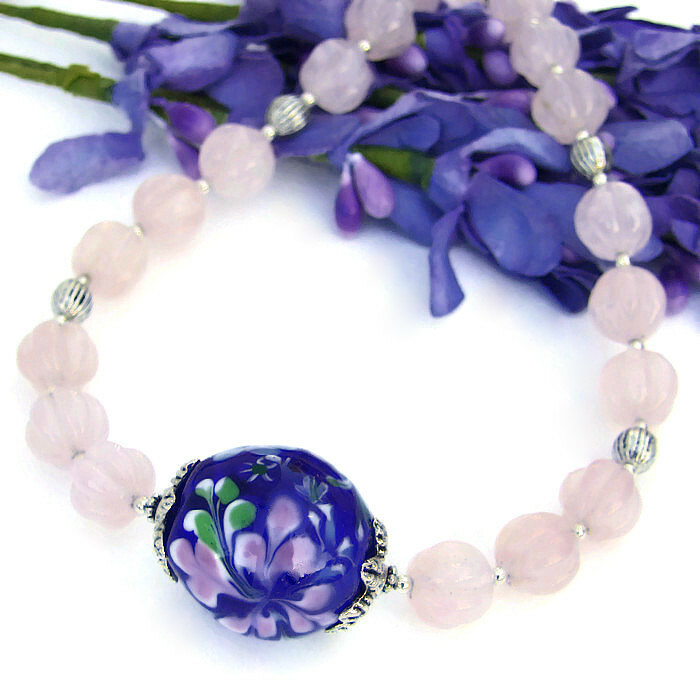 A cobalt blue lampwork glass focal bead with pink flowers is the center of attention of the stunning jewelry design. 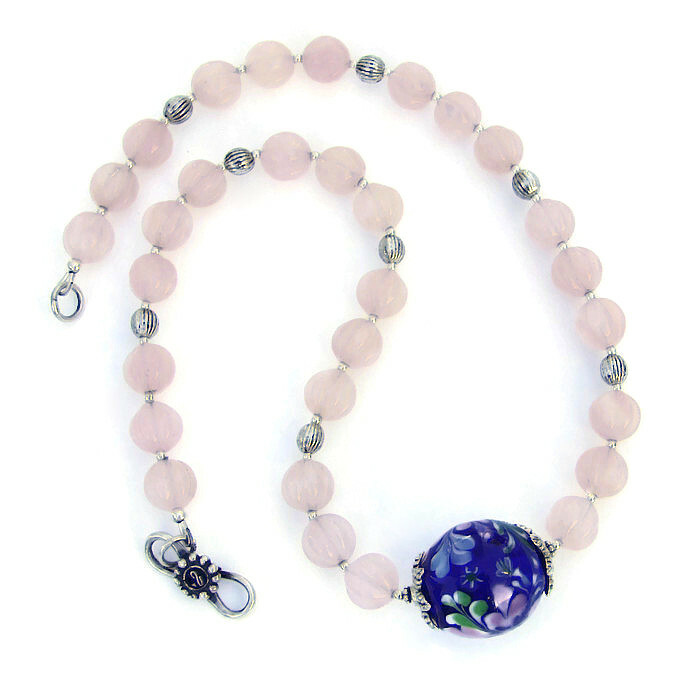 The one of a kind necklace also features pink rose quartz melon beads, ridged pewter beads, leafy pewter bead caps and sterling silver. The eye catching lampwork glass focal was created right in front of me by a very talented glass artist from Fort Worth, Texas. Translucent cobalt blue glass makes up the body of the round art glass bead. Swirling pink flowers with wispy green and pale blue leaves look as if they are exploding out of the deep blue glass. Since the cobalt glass is translucent, it glows beautifully in bright light. 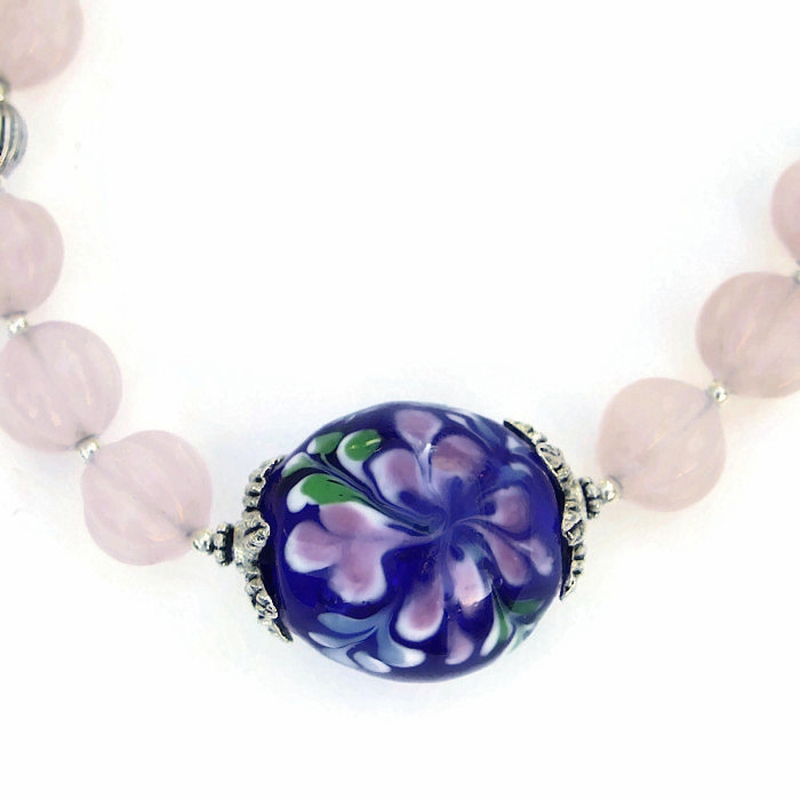 Complementing the flowing flower and leaf design, a leafy pewter bead cap adds even more charm to each end of the lampwork focal bead. 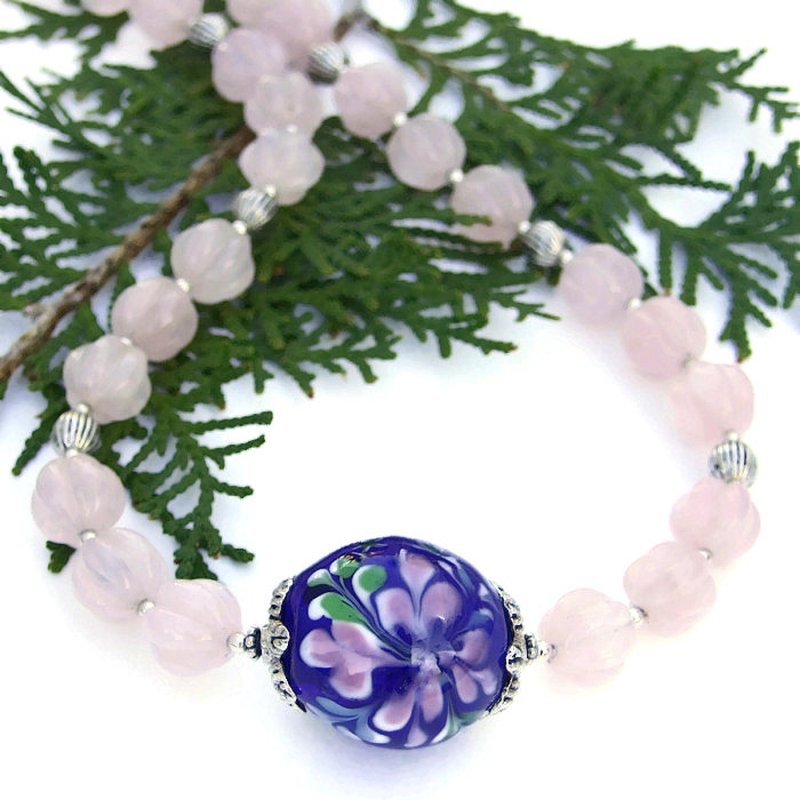 To highlight the pink flowers of the lampwork glass focal, elegant pink rose quartz in a novel melon cut make up the main body of the necklace. The ridges of the melon cut gemstones add lovely texture to the jewelry design and seem to catch and radiate light. 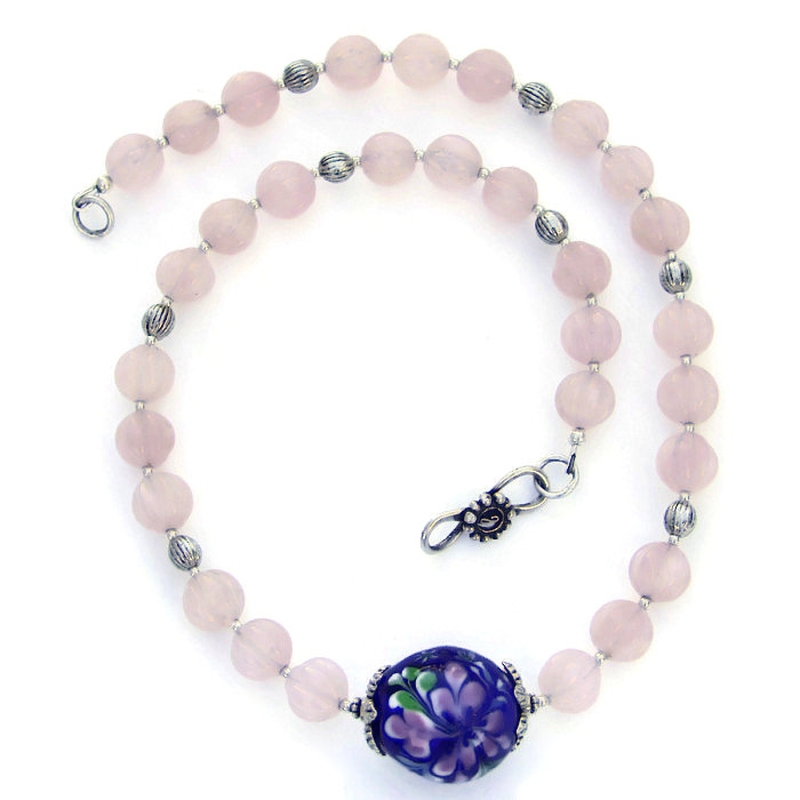 Each rose quartz bead is separated by tiny sterling silver beads, with each group of three gemstones separated by pewter beads with etched ridges. To finish the necklace, a fancy sterling silver s-clasp set was used. 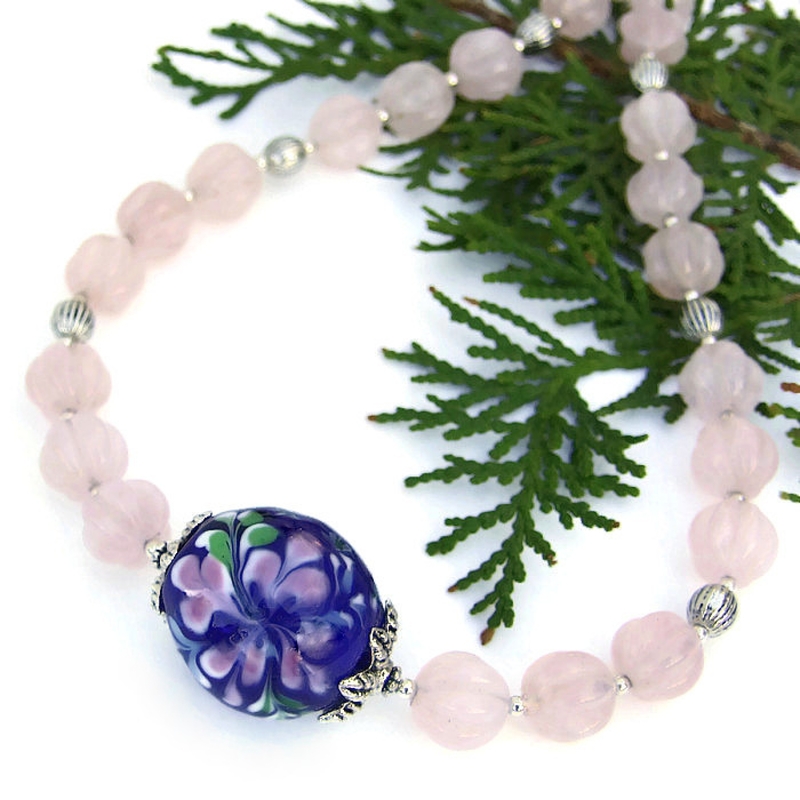 Carefully designed and handmade by Catherine of Shadow Dog Designs, the FLOWER EXPLOSION necklace was created for the woman who adores one of a kind, artisan jewelry. 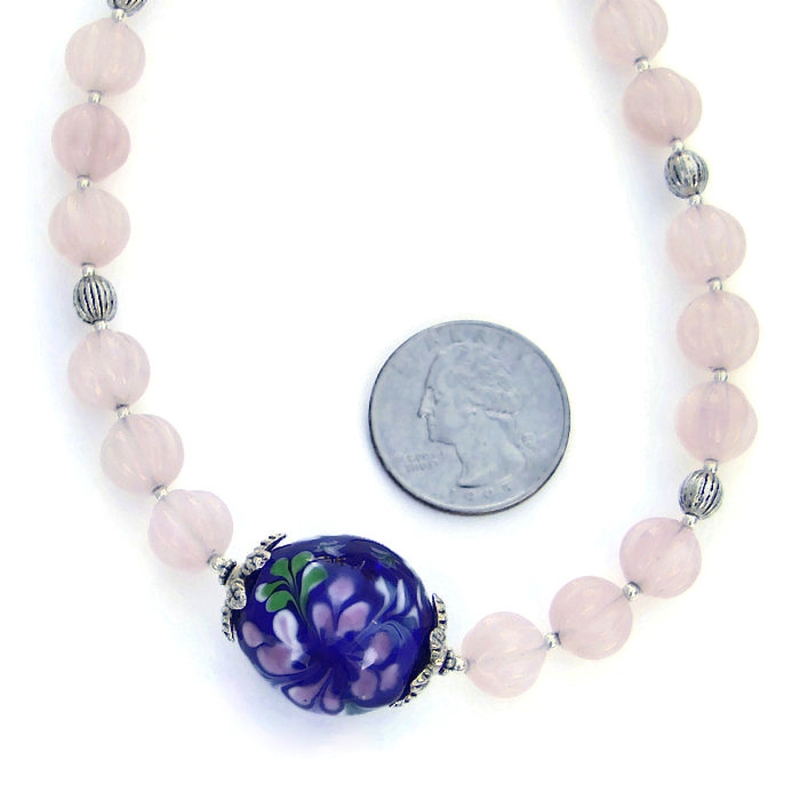 For a better understanding of the relative size of the artisan lampwork glass focal and rose quartz beads used to create the FLOWER EXPLOSION necklace, please be sure to check out photo #6 for a size comparison with a quarter. Through the centuries, flowers have been a symbol of spiritual awakening; also they have been symbols of generosity and love when they are given away. Even though man made, glass is said to carry the energies of transformation, rebirth and communication. 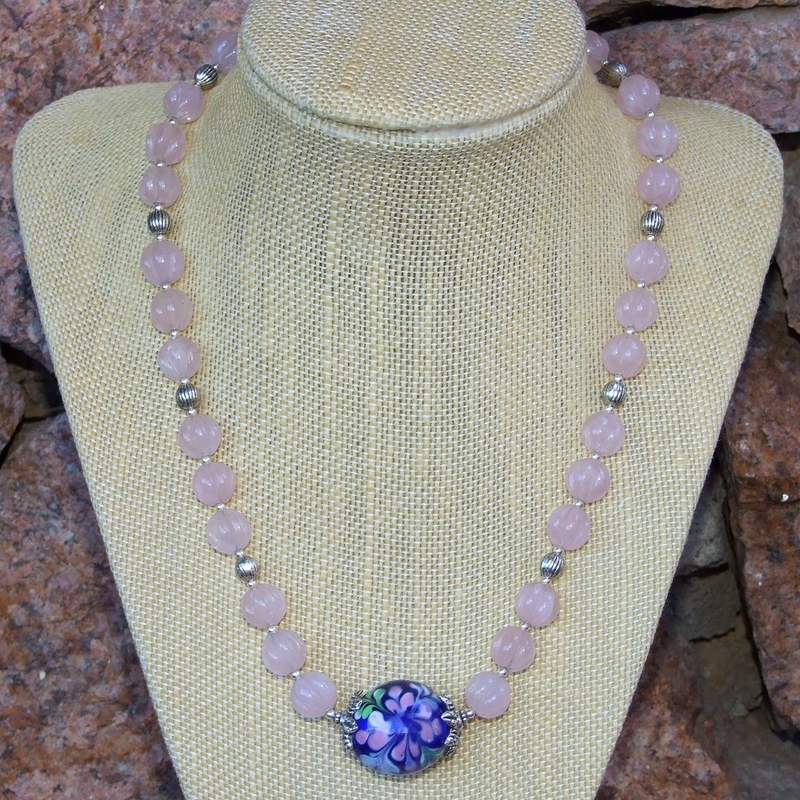 Rose Quartz is often called the “love stone” as it is said to open the heart to all forms of love. Pewter is believed to be very grounding, bringing the wearer back to reality. Silver is a metal of love and healing; it is a mirror to the soul, helping us to see ourselves as others see us. The FLOWER EXPLOSION artisan necklace was carefully designed and handmade in a dog friendly, smoke free studio. The necklace will come with two informational drop tags: one with the piece's name; the other lists the materials used in the necklace and the language of the stones and metals. It will be carefully packed in an organza jewelry bag, perfect for gift giving to a loved one . . . or to yourself!